Capone – Do you mind if it’s a little more? This question, often asked by sales staff at the meat counter the world over, also fully applies to a luxury bass classic in Le Fay’s product portfolio. Because the e-bass Capone is actually a Pangton that’s fitted with an additional head-plate. Just like with the Pangton, the stunning body of the new Capone attaches itself to you to ensure excellent playability and this enables you to play it in a relaxed and energy-saving manner. In early 2018 the Capone was given an extensive update and is now most certainly the best Capone Le Fay has ever made. You’ll love the dynamic reserves of the Capone! Thanks to its three newly developed single-coil pickups and the outstanding active 2-band sound control created by the magnificent electronics specialist Andreas Richter, you can add enough accents with your right hand whenever you want and thus gain the necessary respect in your band that you deserve. Le Fay is totally uncompromising when it comes to producing their hand-crafted instruments: their basses are made with a great eye for detail and with the best-quality materials. For the body and neck, Le Fay uses only the best, perfectly seasoned, organically cultivated and straight-grown wood. Moreover, Le Fay uses only the best aluminium and purest stainless steel as well as select lacquers. 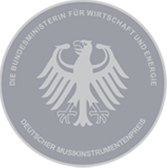 This uncompromising artisanship convinced the jury of the German Musical Instrument Award and won Le Fay first prize in the Bass Making category in 2017. The gallery stops when your cursor is on the photo so you can look at all the details as long as you want. Great, isn’t it? How did the name Capone come about? In case you’re thinking of Alphonse Gabriel Capone – better known as Al Capone – then it’s understandable, but you’re about 40 years off. After all you don’t think foxgloves are gloves worn by foxes, do you? Capone from the premium bass range of Le Fay go back to the early beginnings of the company. The person responsible for the names was Jens Kelting, one of the founders of Le Fay. When he had completed this first Capone, Reiner built a similar instrument but this time with a headless neck that he’d made himself, the Pangton. “The Capone with the serial number 2 already had a neck that I’d built myself and it went to the virtuoso bassist Michael Schürmann in Cologne. It was an amazing experience to watch Michael play this bass at concerts of Volker Kriegel, Tomato Kiss and Alphonse Mouzon,” Reiner reminisces. This Capone was delivered to Cologne from the company headquarters in the picturesque town of Kiebitzreihe in person back then. During a stop in the moory area of Bremen at the house of bassist Ede Brumund-Rüther, who has meanwhile passed away at a far too young age, we ate home-smoked fish on toast in an unbelievably cosy atmosphere. Ede was so impressed by the instrument that he immediately ordered two Capones: one fretless and the other fretted. Whether it should be headless or with a head-plate, i.e. the Pangton or Capone, is up to you. Whichever Le Fay bass you choose, you’ll get a mega-cool instrument that you’ll never want to part with. To try out one of Le Fay’s luxurious basses, contact Le Fay directly or get in touch with one of the Le Fay dealers.